On Easter Sunday, April 21, instead of our usual service time, we will be having two identical services at 9 AM and 10:30 AM. Village kids classes will be available during both services. We hope to see you there! 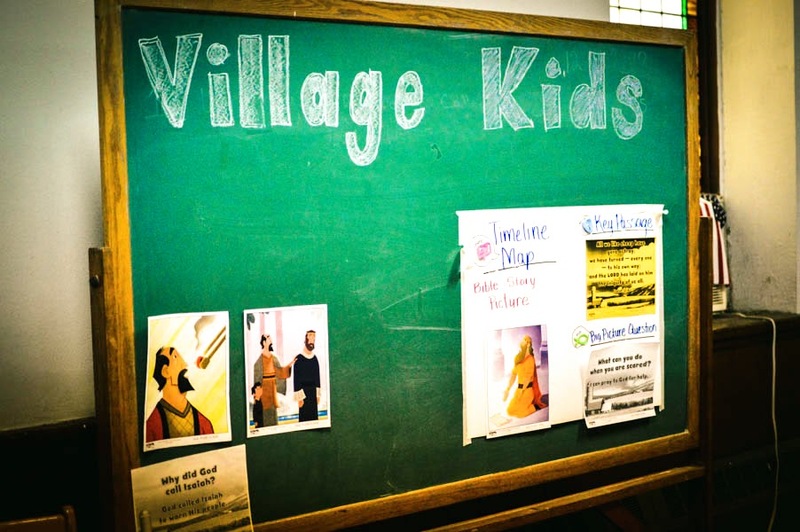 At Village Kids, we aim to provide a safe and fun environment for your children as they learn about Jesus in a fresh and inspiring way. Our program for children (birth-5th grade) runs at the same time as our weekly Sunday worship gathering. From time to time we mix it up – incorporating children into the corporate singing or providing some children’s teaching during the main worship gathering. Our nursery is available for children who can sit on their own through 2 years. Guardians can sign their children in starting at 9:45 am before service and sign them out after service. We kindly ask that all children are up-to-date on vaccinations. We offer puffs, Goldfish, and Cheerios. Guardians can specify which snacks, if any, their children can eat. Nursery workers will not change diapers but will notify guardians if a diaper change is needed. For children preschool-5th grade, we use the Gospel Project curriculum. After children join families for the start of the worship service, guardians can sign children into one of two classrooms: Early Elementary (Preschool-2nd grade) and Upper Elementary (3rd-5th grade). The Upper Elementary class will rejoin the church for communion at the end of each service. Guardians can sign them out at the front left pews. Early Elementary can be signed out at the end of service. Contact Van-Kim if you have any questions.